Blue Ridge, Ga. – A Grand Jury made up of 20 members convened on Feb. 20 and officially indicted those accused in the conspiracy to murder Justin McKinney. Testimony regarding the findings of the investigation was presented to the Grand Jury. Among those to testify were special agents with the Georgia Bureau of Investigation (GBI), law enforcement with the Fannin County Sheriff’s Department, members of Fannin County’s Emergency Services, and staff from the GBI Crime Lab. The witness list also included personal testimony from victim Anna Franklin, roommate Donald Majors and co-defendant Lakota Cloer. After hearing testimony, the Grand Jury found that enough evidence was presented to indict each individual that had previously been detained in connection with the murder with a number of charges. Cloer has already pled guilty to the lesser charges of two counts Aggravated Assault and one count Robbery by Intimidation. As part of the plea deal Cloer faces a 40 year sentence, 15 of those years to be served in prison with the remaining 25 years to be served on probation. Cloer recently turned 17 years old and according to Georgia law is no longer considered a minor. Sources tell FetchYourNews that Cloer was moved from the juvenile facility housing him to a state prison on his birthday. The charge of Malice Murder is in direct relation with the shooting death of Justin McKinney. In the state of Georgia malice murder means the intent to take a life without legal justification or mitigation. In this case the State does not need to prove a motive in order to obtain a conviction but instead will attempt to show that the person accused deliberately intended to take another person’s life. Criminal Attempt to Commit a Felony is in relation to the shooting of victim Anna Franklin. By discharging a firearm in her direction and ultimately wounding her, the accused are being charged with the intent to commit a specific crime. In this case the intent was to commit malice murder. Felony Murder of Justin McKinney. Felony murder charges are brought about when the accused commit the offense of murder while in the process of engaging in other felony related offences. The State alleges in this case of felony murder that the following felony offences were taking place: Home Invasion, Burglary in the First Degree, Aggravated Assault, and Criminal Attempt to Commit Armed Robbery. The State also brought charges of Criminal Attempt to Commit a Felony. This charge is in relation to the intent of the accused specifically planning and attempting to carry out Armed Robbery. This charge is further laid out in the accused’s premeditation of the event and the steps taken to carry out the crime. Each defendant has been charged with five counts of Aggravated Assault. Each count is in direct relation with the crimes committed against both Justin McKinney and Anna Franklin and focuses on the use of firearms. 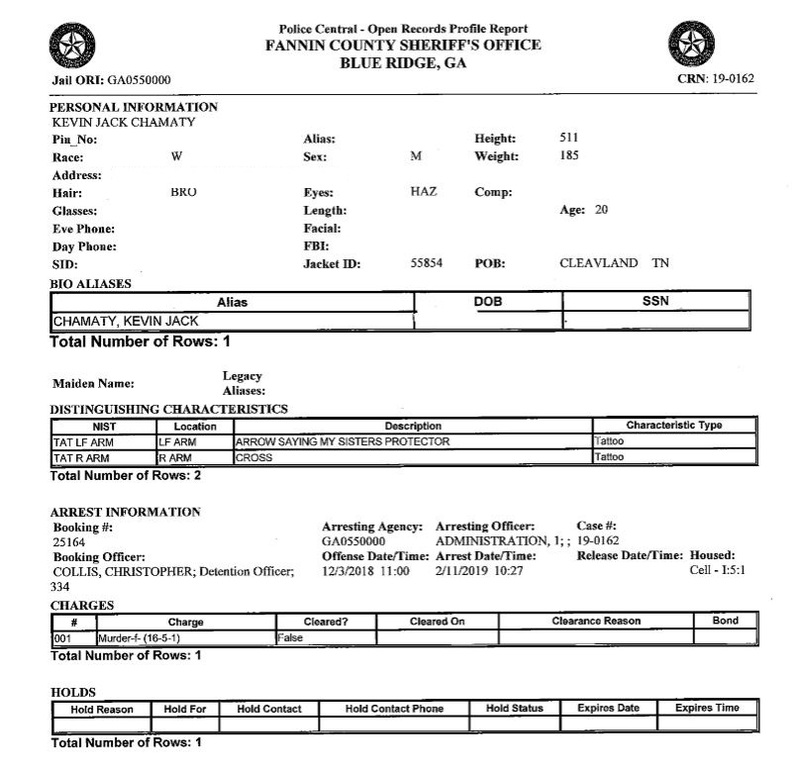 The Aggravated Battery count pertains to Anna Franklin and how essentially her body was rendered “useless” due to the gun shot she received that went through her arm and lodged in her neck. The two counts of Home Invasion in the First Degree charges the defendants with entering the Franklin home without authority and with intent of forcible felony. This count explains that the accused entered the home with deadly weapons with intent to commit Armed Robbery. Burglary in the First Degree is a similar charge to the Home Invasion in the First Degree in that it claims the accused entered the dwelling with intent of Armed Robbery and in possession of deadly weapons. By conspiring to commit Armed Robbery with the intent to also commit murder, all five defendants face a count of Violation of Racketeer Influenced and Corrupt Organizations Act. The state shows that through the accused’s actions there was a pattern of conspiracy and criminal activity. According to the federal law, The Racketeer Influenced and Corrupt Organizations Act, commonly referred to as the RICO Act or simply RICO, provides for extended criminal penalties and a civil cause of action for acts performed as part of an ongoing criminal organization. The three defendants charged with Possession of Firearm During Commission of a Felony are Dye, Hill, and Manuel. The counts claim Dye possessed a Rossi 410 shotgun, Hill was in possession of Grendel Inc. p-12 .380 handgun, and Manuel carried an Excam .25 caliber handgun. Lastly Chamaty and Havard face charges of Tampering with Evidence by abetting Dye, Hill, and Manuel in the removal and concealing of the weapons used in the crime. Follow FetchYourNews for the latest information involving the case. You can read more about the McKinney Murder Case by clicking the links below. 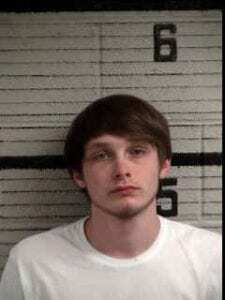 Blue Ridge, Ga. – “What I am going to do here, is I am going to set bond at $50,000,” Appalachian Judicial Circuit Superior Court Judge Brenda Weaver made her ruling and granted bond for Michael Chase Havard age 20 and Kevin Jack Chamaty age 20, both of whom have been charged in connection with the murder and Justin McKinney and assault of Anna Franklin. The terms of the bond are strict with both men being required constant supervision and a host of stipulations that if not followed will result in immediate arrest. The courtroom was packed in Pickens County as the two young men each had lawyers present their case for being allowed bond. Appalachian Judicial Circuit District Attorney B. Alison Sosebee recounted the events that led to the arrest of Havard and Chamaty in a written statement given by Georgia Bureau of Investigation (GBI) Special Agent Jamie Abercrombie. Defense Attorney Brian Steel presents the case for bond to be granted for his client Kevin Jack Chamaty. According to Abercrombie both men knew of the conspiracy to murder and rob McKinney and aided in the act by providing gas and rides the night of the incident on Dec. 4, 2018 and also helped in disposing of one of the weapons used in the crime. The GBI learned of the young men’s involvement after Havard voluntarily came forward and spoke with investigators about his knowledge and the roles that he and Chamaty played in the events surrounding the case. While Hyde is no longer married to Chamaty’s mother, Christy Hyde, Christy still resides in the home with Hyde and is currently serving 15 years probation for a methamphetamine and weapons charge in 2015. It was pointed out that Chamaty’s mother is serving under the First Time Offenders Act. Gerald Patterson, who resides with Chamaty’s grandmother Rachel Newman, also took the stand to testify on behalf of Chamaty receiving bond. Patterson who has resided with Newman for approximately 5 years, spoke of his belief that Chamaty does not pose a threat to the community, and like Hyde was willing to “put up his wealth” as a guarantee. “Yes ma’am it is,” Patterson replied to Sosebee’s question. Chamaty, himself, does have a prior record with law enforcement, but the nature of his charges were never fully disclosed in court. Despite Chamaty having a family with a history of run ins with the law, many supporters were present for the young man. The gallery stood to show their support of Chamaty and Havard. Approximately 30 people rose and remained standing as they testified their belief that Chamaty would in fact return to court and does not pose a threat to the community. Chamaty became visibly emotional during this phase. “Nobody is in any way diminishing the loss of life for any person or living creature, but here we stand before the court in a position where Mr. Chamaty is cloaked with the presumption of innocence,” Steel concluded his case and pointed to the fact that Chamaty had followed a legal process in dealing with this case thus far and had voluntarily turned himself in. Sosebee argued for the court to deny bond questioning why a 20 year old would be living with a 16 year old (Lakota Cloer : co-defendant in the case) and pointing to lack of accountability by the family prior to the incident. Sosebee added that while Chamaty had voluntarily turned himself, he had also “voluntarily facilitated the commission of those acts” in the crimes he is alleged to have participated in on Dec. 4. Ultimately, Weaver granted bond set at $50,000. Along with this bond, Chamaty must be under constant supervision from Mr. Hyde including going to work. Chamaty will be under house arrest and only allowed to leave with Mr. Hyde for work, church, medical or legal appointments. Chamaty will also be subjected to random drug testing in which he must call every morning to find out if he will be tested that day. No contact with victims or co-defendants including co-defendant’s families will be allowed, and a curfew of 8 p.m. is set in place. Both Hyde and Patterson put up their personal property to insure the bond. Havard and Chamaty sit with their attorneys awaiting Weaver’s decision to grant bond. Havard’s terms of bond were very similar to the parameters set in place by Weaver for Chamaty’s bond. Havard’s father, Chris Havard, spoke on his son’s behalf. He explained that his son had contacted him regarding the events that took place on Dec. 4 and that he had advised his son to go to the police in which Havard did almost immediately. Havard’s father explained that while he would like for his son to return with him to North Carolina if granted bond, he understood that that might not be possible and had made arrangements for his son to live with his grandmother in Ellijay, Ga.
Diane Conway, Havard’s grandmother took the stand to confirm that she would take responsibility upon Havard’s release. Judge Weaver expressed her thoughts on the responsibility of all involved in the case. “If he’s to work, I don’t know how I would do that. I would just have to keep him at home with me,” Conway did express concern about being unable to supervise him on a job. The court handed down the same stipulations of bond that were set forth for Chamaty with the exception that the bond could be amended if Havard gained employment and at a minimum would be required to where an electronic monitoring device while at work. Both Conway and Chris Havard put up personal property to insure Havard’s bond. All insurances by both families will need to be approved by the Fannin County Sheriff’s Office prior to release. The bond issued will also cover any further charges that might be handed down by a Grand Jury. All suspects are expected to face a Grand Jury soon in Fannin County and move forward to trial. Blue Ridge, Ga. – Two more have been arrested in the McKinney murder case. Twenty year old Michael Chase Havard and twenty year old Kevin Jack Chamaty. Both individuals are being charged with murder. 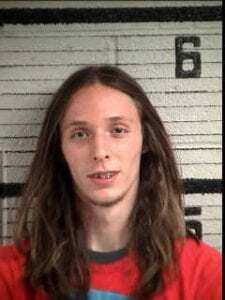 Attention was first drawn to Havard and Chamaty when Georgia Bureau of Investigation (GBI) Special Agent Jamie Abercrombie testified at an initial appearance and bond hearing for the juveniles also charged in the case. 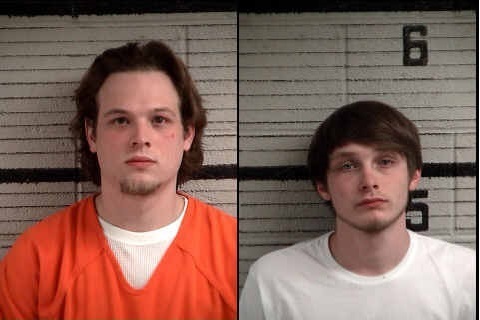 (Left to Right) Kevin Jack Chamaty (Age :20) and Micheal Chase Havard (Age :20) have been charged in connection with the murder of Justin McKinney. According to Abercrombie another individual came forward on night of Wednesday Dec. 5, 2018. Havard voluntarily arrived at the Fannin County Sheriff’s Office and told staff that he had information regarding the McKinney murder. Abercrombie said, “Havard provided a written statement.” The Special Agent also told about how Havard shed light onto the shooter of Franklin. Havard was visiting a friend, Kevin Chamaty, who resided at Lakota Cloer’s residence on Dec. 3. Cloer who had been charged in the McKinney murder accepted a plea deal in which he will have to serve 15 years behind bars. It was during this visit that Havard recalled Hunter Hill, Blake Dickey, both of which have been charged with the murder of Justin McKinney and assault of Anna Franklin, along with Cloer and another individual, 15 year old Levi Manuel, were discussing the plans to “pop and rob” McKinney. According to the interview with Havard, Hill said that the four were “going to rob someone who had marijuana and pills” and asked Havard if he wanted in. Hill also told Havard that they were going to shoot everyone there and take whatever they have. Havard declined and left with friend Chamaty to go to Walmart. Chamaty received a call later that night in the early morning hours of Dec. 4 from Cloer. Cloer stated that he was on Maple Grove Road and was in need of gas. Havard and Chamaty drove to meet Cloer and gave him gas for his truck. Cloer was by himself and told Havard that he had dropped off Hill, Dickey and Manuel on Elrod Lane. Having not heard from Manuel, Havard and Cloer went to look for the three. Chamaty parked at a church and waited for Havard to return. As Havard walked down Elrod Lane, he says that he saw a light and heard “it’s me” in a voice that he recognized as Manuel. Once back to Cloer’s truck the juveniles, along with Havard, met Chamaty and proceeded back to the Cloer residence. “Mr. Hill had made statements that everyone was dead,” Abercrombie recalled Havard’s testimony. Havard also stated that Manuel made comments that he had unloaded a clip into the girl and that Hill, who was last out of the residence, stated that he had finished Franklin off and killed Donald Majors, a third resident who was present at the Franklin home where McKinney had been murdered. The boys at this point believed that everyone in the home was deceased. Havard stated that Manuel was the one who had the .25 caliber handgun, and admitted that he had advised Cloer to dispose of the weapon. Cloer attempted to scratch off the serial numbers on the handgun before getting rid of the weapon. Chamaty then drove Havard and Cloer to the “cliffs at Nottely Lake” where Cloer threw the gun into the water. Havard later took FCSO Investigator John Arp and GBI Special Agent Abercrombie to Nottely Lake and showed where the handgun had been thrown. With the help of divers the gun was recovered. FetchYourNews will keep you up-to-date as further details emerge surrounding the McKinney Murder Case. 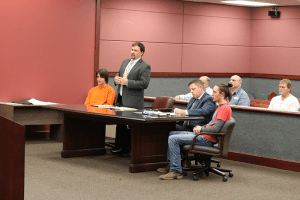 Blue Ridge, Ga. – There was a noticeable absence at the preliminary hearing that was held regarding the death of Justin McKinney and the deadly assault of Anna Franklin. In the courtroom were Blake Dickey (also known as Blake Dye), Hunter Hill, and attorney Bruce Harvey who spoke on behalf of his client Levi Manuel. All three boys have been accused in the shooting death of McKinney that took place on Dec. 4, 2018. Not in the courtroom during this initial phase was the fourth juvenile accused in the case, Lakota Cloer, and while his attorney Charles Fulcher was present, unlike Harvey, he did not speak to his client’s absence. After bond was denied in the case of accused shooter Blake Dickey, the courtroom cleared, and Lakota Cloer was brought in. Cloer’s family, along with family members of Justin McKinney, watched as Cloer plead guilty to lesser charges. Emotions were high on both sides. 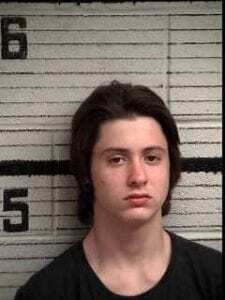 16 year old Lakota Cloer was arrested in Dec. 2018 for his role in the McKinney murder. Sosebee explained that family members of the victims had been notified of this deal, and that there had been extensive discussions with defense attorney Fulcher. 1 Count Aggravated Assault : This charge is in relation to victim Justin McKinney. Cloer is being charged in aiding and abetting in this crime, as well as having knowledge of the crime. 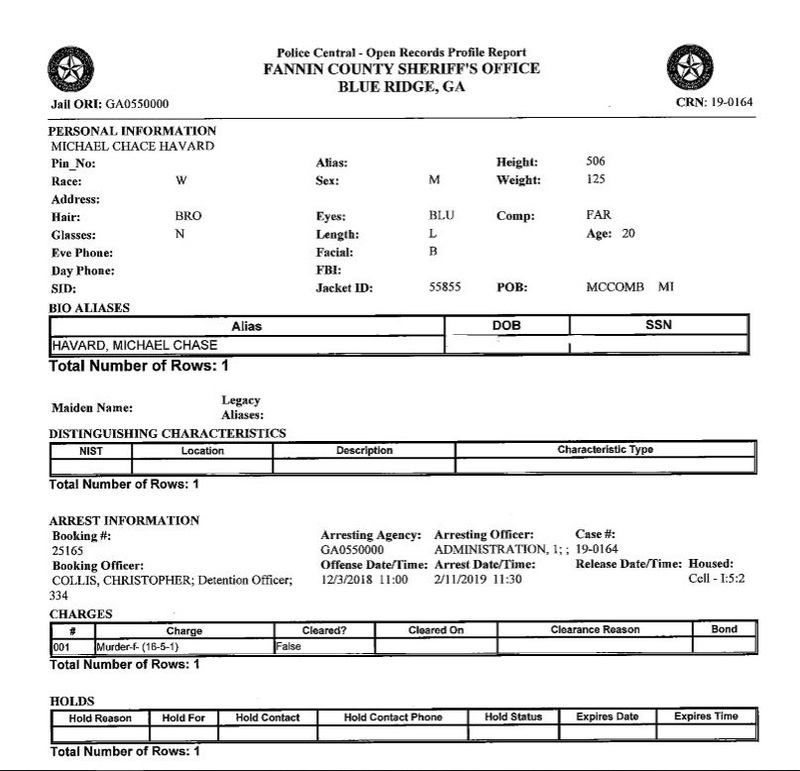 1 County Robbery by Intimidation: This charge is in relation to the motive that ultimately ended in the death of McKinney and the serious injury of Franklin. As with the other charges this applies to Cloer since he engaged in discussion and planning of the crime. Along with aiding and abetting Cloer also admits to providing a gun to co-defendant Levi Manuel. 1 Count Aggravated Assault: This charge is in relation to victim Anna Franklin. Cloer admits guilt to intentionally aiding and abetting in this crime that involved the use of a deadly weapon. By reaching a plea bargain, Cloer waived several rights including that to have a trial by jury and for his case to be seen in front of a grand jury. It was revealed during this hearing that Cloer had previously been diagnosed with bipolar disorder and had been and is currently on medication to combat symptoms. Despite this diagnosis no competency or psychological testing was performed to evaluate Cloer’s state of mind. 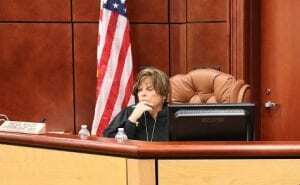 Appalachian Judicial District Chief Superior Court Judge Brenda Weaver asked Cloer a series of questions to satisfy the court of Cloer’s competency and to have a record of his replies. Weaver also questioned Cloer’s mother, Amanda McGaha, about her feelings on her son’s mental state and if she felt Cloer understood what was happening in the courtroom. McGaha replied that she was confident that her son understood the proceedings now that he was on proper medication. Cloer was able to reply clearly to each question asked by Judge Weaver which allowed the proceedings to move forward. Weaver explained that sentencing for his plea would take place that day, but that a restitution hearing would be scheduled at a later date. A restitution hearing will determine what, if any, payments Cloer will have to pay to the victims for the harm caused by his wrongful acts. Cloer sets alongside accused Levi Manuel at a first appearance in Fannin County. With that the sentence was handed down. For the first Count of Aggravated Assault in relation to Justin McKinney, Cloer is sentence to 20 years having to serve 15 of those years in the Georgia State Prison System. The second Count of Robbery by Intimidation will have Cloer serving 10 years in the Georgia Prison System. This sentence is to run concurrent with the sentencing from Count One. Lastly, Cloer was sentenced to 20 years of probation for the Aggravated Assault of Anna Franklin. This sentence is to run consecutively with the sentencing from Count One. Overall, Cloer received a 40 year sentence, 15 of those years to be served in prison with the remaining 25 years to be served on probation. A victim impact statement prepared by McKinney’s mother, Debra McKinney Bignardi, was read by District Attorney Sosebee. According to this statement, at the time of McKinney’s murder the family was also dealing with the impending loss of one of McKinney’s nephews “who spent his last days on Earth mourning the loss of his uncle”. Bignardi was left wondering why. Why the death of her son, why if he had done something wrong that the boys did not feel that he too deserved a fair trial as they were getting. She noted 6 families were victims of this crime, and that by taking the life of her son, Justin McKinney, that the boys had also in a sense taken their own lives, and that all the families are left to mourn the future. “This is a tragedy in every sense of the word,” Weaver went on and expressed hope that others will learn from this. Weaver stated that she hopes for youth to recognize and stay away from activities that can lead to criminal behavior, and that parents will be more involved in their children’s lives, knowing who they are with and knowing where they are. As court was recessed Cloer was allowed to briefly speak to his family. The group shared a very emotional goodbye before Cloer was escorted out of the Fannin County courtroom to begin his sentence for his part in the McKinney murder case. 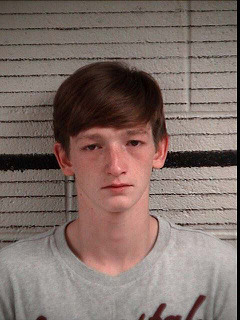 Blue Ridge, Ga. – Only one of the four accused in the McKinney murder case sought bond after the preliminary hearing took place in a Fannin County Courtroom. The State had met their burden of proof in establishing a case against the boys being charged with Malice Murder, Felony Murder, Aggravated Assault, and Aggravated Battery. 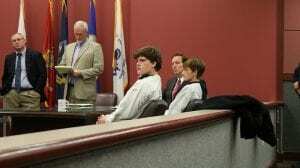 Now the burden of proof fell upon the defense to satisfy reasoning for letting any of the boys out on bond. Fifteen year old Blake Dickey (also known as Blake Dye) sat alongside his attorney David Farnham as the court began the bond hearing. Farnham argued that his client, Dickey, should be considered for release, and did in fact satisfy all the factors required by state law in Georgia for this consideration. According to Farnham, Dickey had no prior convictions and had never been involved in anything violent in his life. If released Dickey did not pose a threat to the community and was not a risk for intimidation of any witnesses. Farnham went on that if the court granted bond, Dickey would return to school where he would be supervised by a panel of teachers and that Dickey would begin residing with his mother where he would be under constant supervision at home. Accused Blake Dickey (left) sits next to accused Hunter Hill at a previous hearing. The Appalachian Judicial Circuit District Attorney, B. Alison Sosebee stepped in and presented her thoughts regarding the bonding of Dickey. Attorney Karen Shelley opted to not file a motion for a bond hearing at the time, leaving her client, accused 15 year old Hunter Hill to remain in a juvenile detention facility for the time being. A third party in the group of juveniles accused, Levi Manuel, will have a preliminary hearing and possible bond hearing at a later date. This comes from Manuel recently switching his legal representation. Attorney Bruce Harvey of Atlanta, Ga. will now represent Manuel in the McKinney murder trial. This move came as a surprise to the court and to Manuel’s previous council attorney Andrew Wehunt. Judge Weaver noted that while she had received Harvey’s appearance filing that she did not see a withdraw from Wehunt, and thought that Wehunt might have been taken off guard by this move. Harvey, the high profile Atlanta based attorney, has represented his fair share of clients in Manuel’s position and was already making moves in the courtroom as he asked for a delay in Manuel’s first appearance / bond hearing. According to Harvey, Manuel’s previous council had filed a motion for a psychological and competency evaluation to find out if the boy was capable of standing trial. This evaluation was never completed and Harvey felt that moving forward without this information would not be in his or his client’s best interest. Judge Weaver along with District Attorney Sosebee agreed to have this testing done and postpone the first appearance hearing. Manuel’s hearing has tentatively been moved to take place on Feb. 18, 2019. Next Article » Coming Soon - 1st Annual Blue Ridge Soap Box Derby! Blue Ridge, Ga. – The prosecution painted a picture of what took place in the early morning hours of Dec. 4, 2018 that left one Fannin County resident, Justin McKinney, dead and another, Anna Franklin, seriously injured. According to the state’s findings, the McKinney murder was not a case of revenge but rather a cold blooded, premeditated murder, in which the juveniles involved intended to “pop and rob” the victims. Georgia Bureau of Investigation (GBI) Special Agent Jamie Abercrombie was assigned to the case when Captain Justin Turner of the Fannin County Sheriff’s Office (FCSO) contacted GBI for assistance with the murder. Special Agent Abercrombie recalled listening to the 911 call placed by victim Anna Franklin the night of the murder. Accused Hunter Hill (15) and Blake Dickey (15) set in a Fannin County Courtroom at a previous appearance. Both Dickey and Hill knew the victim McKinney well and had been to his home on numerous occasions to buy marijuana. The scene at 135 Elrod Lane in Morganton, Ga. was laid out, as Abercrombie described walking into the single-wide trailer. The kitchen and living room had an open floor plan and there was a bedroom located on either side of this main area. Franklin who had already been taken to the hospital had been shot through the arm, which she had used to shield her face during the attack, and the bullet, unable to be removed, remains in her neck. Two .25 caliber shell casings were found at the crime scene. These belonged to the weapon used to attack Anna Franklin. Abercrombie later learned that a third resident of the home had been present the night of the shooting. Donald Majors was asleep in the second bedroom when the shooting occurred, but having drank heavily before retiring Majors did not even know a shooting had occurred. “They (FCSO) woke him up. He was asleep in his room and law enforcement woke him up,” Abercrombie told the story of Majors being unable to provide any details of the night during her interview process. 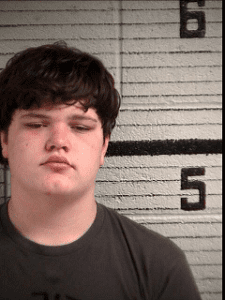 Abercrombie, along with GBI Special Agent Dustin Hamby, located both Dickey and Hill at Fannin County High School the next day, and by coordinating with school staff were able to apprehend the two fifteen year olds in the principal’s office and take them in for questioning. “He was not truthful with me in the beginning,” Abercrombie said of her interview with Dickey. After a short time Dickey did tell his story of the night and admitted that he had been the one to kill McKinney with the shotgun. Dickey stated to Abercrombie that they had planned it out and that they had planned to shoot both McKinney and Franklin. Dickey did claim that the killing was done out of revenge. 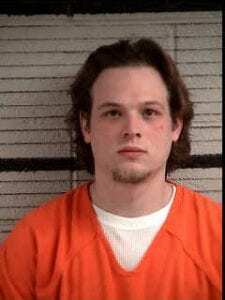 According to Dickey, McKinney had been selling Hill’s older brother, Logan Hill, methamphetamine (meth) and that Logan had become severely addicted and was injecting the drug. This addiction had left Logan hospitalized, and McKinney was the one who provided the meth. Dickey was the only juvenile involved that Abercrombie heard this motive from at that time. Hill who was interviewed by Special Agent Hamby backed up Dickey’s recollection of events, and both boys were arrested on the spot. 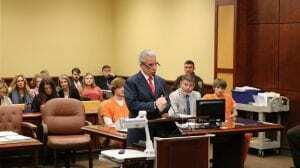 District Attorney B. Alison Sosebee at a previous appearance with defendant Lakota Cloer (16) present. When left alone with FCSO Chief Deputy, Major Keith Bosen, Hill is noted as claiming if given the chance, he would do it again. Dickey also mentioned that 16 year old Lakota Cloer had driven them to the residence on Elrod Lane. This was the first mention of someone other than Dickey and Hill being involved, but more would come forward that would implicate Cloer as well. Another individual came forward on night of Wednesday Dec. 5, 2018. Chase Havard voluntarily arrived at the Fannin County Sheriff’s Office and told staff that he had information regarding the McKinney murder. Havard was visiting a friend, Kevin Shamaty, who resided at the Cloer residence on Dec. 3. It was during this visit that Havard recalled Hill, Dickey, Cloer and another individual, 15 year old Levi Manuel, were discussing the plans to “pop and rob” McKinney. Havard declined and left with friend Shamaty to go to Walmart. Shamaty received a call later that night in the early morning hours of Dec. 4 from Cloer. Cloer stated that he was on Maple Grove Road and was in need of gas. Havard and Shamaty drove to meet Cloer and gave him gas for his truck. Cloer was by himself and told Havard that he had dropped off Hill, Dickey and Manuel on Elrod Lane. Having not heard from Manuel, Havard and Cloer went to look for the three. Shamaty parked at a church and waited for Havard to return. Once back to Cloer’s truck the juveniles, along with Havard, met Shamaty and proceeded back to the Cloer residence. “Mr. Hill had made statements that everyone was dead,” Abercrombie recalled Havard’s testimony. Havard also stated that Manuel made comments that he had unloaded a clip into the girl and that Hill, who was last out of the residence, stated that he had finished Franklin off and killed Majors. Cloer attempted to scratch off the serial numbers on the handgun before getting rid of the weapon. Shamaty then drove Havard and Cloer to the “cliffs at Nottely Lake” where Cloer threw the gun into the water. The shotgun was also recovered. Manuel who was residing at the Cloer residence at the time of the murder, gave investigators the gun which had been hidden between the mattresses in his bedroom. Accused Levi Manuel (15) and Lakota Cloer (16) at previous hearing regarding McKinney murder case. Manuel was later interviewed and told his side of the events that night. He claimed to not know Justin McKinney. Stepping outside briefly after the three boys entered the home, Manuel said that he heard a gunshot, and rushed back inside. Once inside he saw Dickey standing over McKinney’s body. At this point Manuel says that he aimed his gun above Anna Franklin and shot. Manuel admits to having shot the gun more than once. According to Abercrombie, Manuel claims “they got scared and ran out and forgot to take anything”. Much like the Manuel and Havard account, Cloer paints Hill as the mastermind behind the crime, saying that Hill presented the entire idea and said that he knew someone they could “pop and rob”. According to Abercrombie, Cloer also stated that “Mr. Dickey follows whatever Mr. Hill does”. “Mr. Cloer knew that pop meant to kill and Mr. Hill made statements they would kill him (McKinney) and take what he had,” Abercrombie told of Cloer’s testimony and added that the boys had intended to steal marijuana and pills. Cloer says that Hill never mentioned his brother, Logan Hill, never mentioned revenge and did not show any anger about McKinney. Cloer admitted to his involvement saying that he did give Manuel the handgun that he later tried to alter and dispose of, and that he was also the driver that dropped the boys off. The charges against the accused include Malice Murder, Felony Murder, Aggravated Assault, and Aggravated Battery. A search warrant was obtained for the 135 Elrod Lane where the crime took place. Marijuana was the only illegal substance found at the home. The juveniles remain in custody awaiting trial.